As I have been tramping around the local woods this spring photographing orchids and birds I noticed something that I’d never seen before. 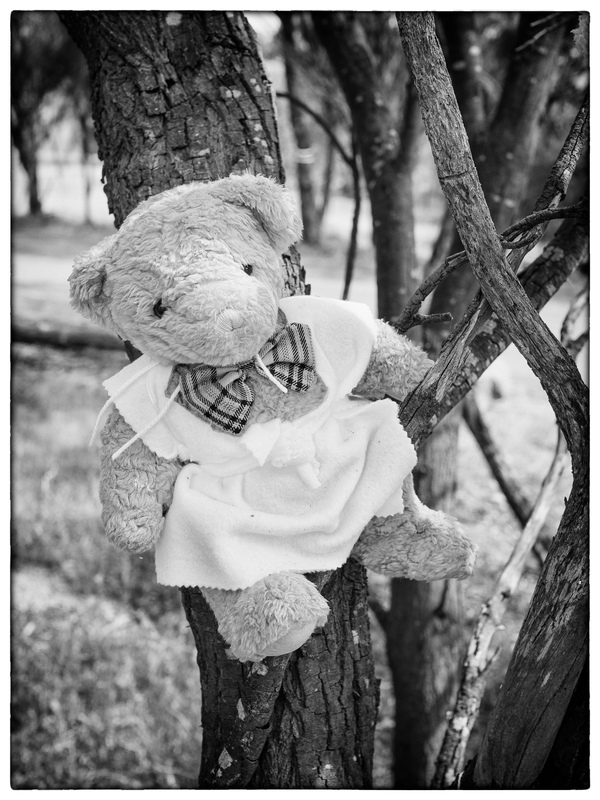 That something was teddy bears tied to trees in odd remote locations. At first I thought it was strange game being played by the local kids, but after I saw my tenth one I decided to ask about and find out what was going on. It took ages to find someone who would answer my questions. Eventually an acquaintance told me to go and see Cliffy. Cliffy wasn’t that easy to find. The directions up to his shack in the wandoo forest were very vague – turn off the Great Southern Highway onto Talbot Road, drive for 10 Km and then take the third track on the left. Turn right at the dead tree that looks like an “excited” Tony Abbot in Speedos and then right at the big rock. I found the shack. When I say shack that really sounds better than it is. A few sheets of corrugated tin and some bush poles was all it was. When I saw Cliffy it was plain to see that he’d had a hard life. He is a compact sinewy man with skin the colour of tanned leather and hair like iron filings. His hands were a testament to hard physical labour – even the callouses had callouses. As to his age, well if you told me he was 100 I’d believe it and if you said he was 50 it wouldn’t surprise me either. So after the usual “Howz yer doin’?” Followed by a quick discussion about rainfall and rain gauges* I asked him about the bears. Cliffy sucked his single tooth and rolled a couple of strands of tobacco in some paper that looked like it had been torn from a pocket Bible. Slowly and quietly he says in a voice that sounded like he’d been gargling on razor blades “They’re memorials to victims of Drop Bear attacks”. He lit up and took a long drag and then told me the strangest tale. I scurried home to do some research. The Australian Geographic magazine did an article in 2013 about a University of Tasmania (UTAS) research project looking at who were more susceptible to attacks. 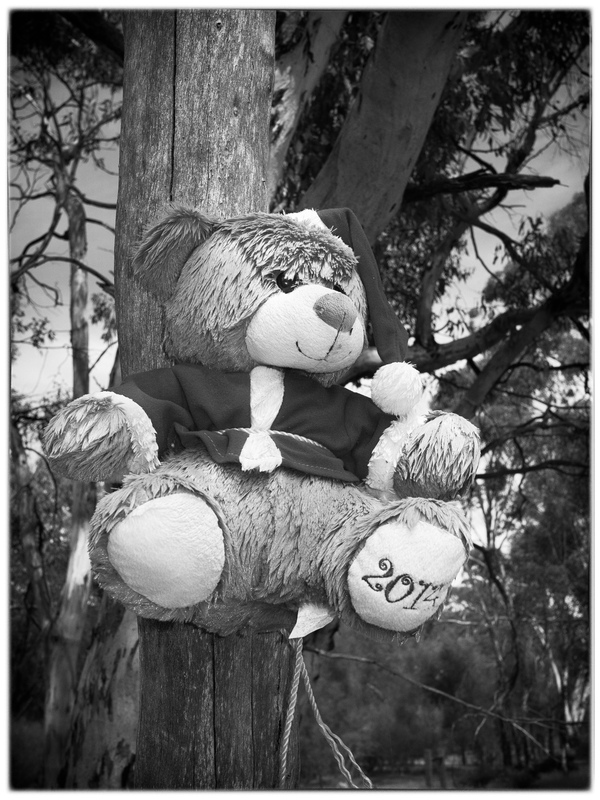 In 2012 there was a research project looking to track Drop Bears in bush and see how many there actually are. An excerpt from that paper can be read here. I even managed to find online an old public announcement film for new migrants dating from the 1950’s warning of the dangers posed by Drop Bears. 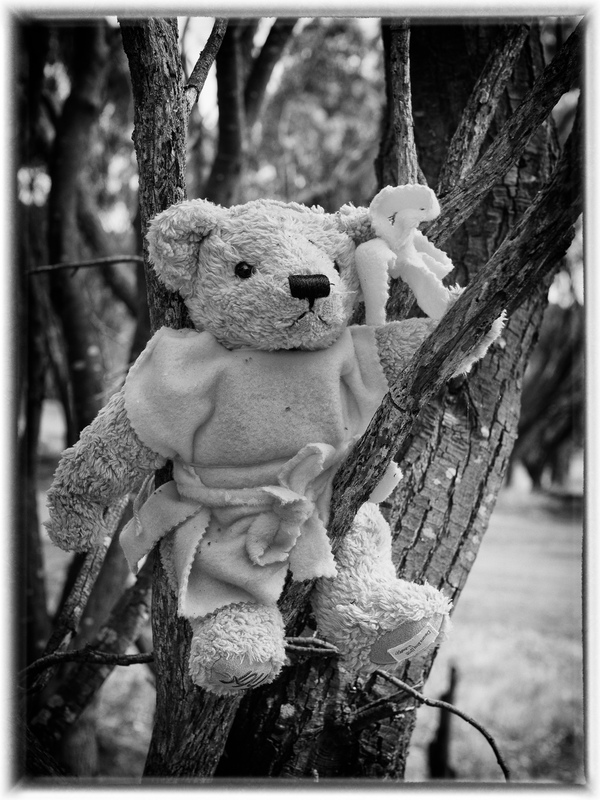 So if you venture into the Australian bush and see teddy bears tied to the trees be aware that Drop Bear attacks have happened in the area and you’d be best advised to leave. * All conversations in this part of the world follow this pattern. It’s considered very rude not to ask about someone’s rain gauge.